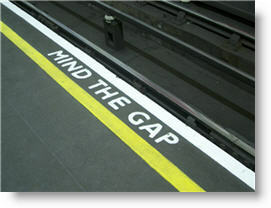 We have to view gaps differently from the '90s because of 24 hour trading. Gaps are no longer real indications of direction, as more and more traders trade actively before the regular trading sessions to deal with things like economic data announcement around 8:30, 9:00, etc. In short, gaps are now partly the real gap, and partly real trading by real participants. Mr. Chan's comment that 24-hour trading has changed the nature of gaps is very good. In particular, the last hour of S&P 500 futures trading before the New York Stock Exchange opens, during which events such as employment reports occur, is just as active in terms of price movement as some of the floor trading hours.